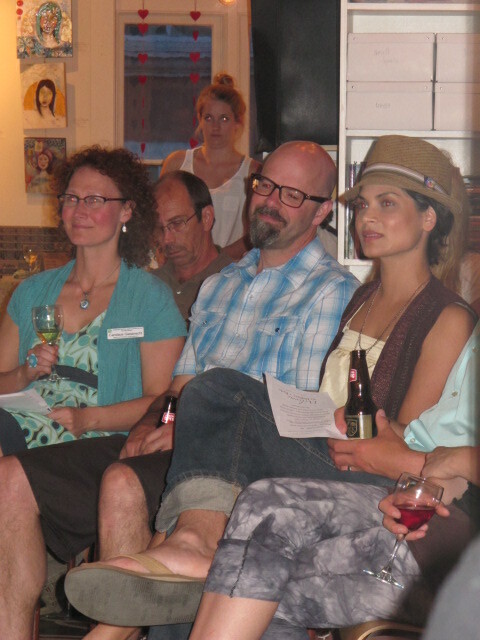 So much to catch up on…..let’s pick up at the concert in Kelowna on Sat May 11th. 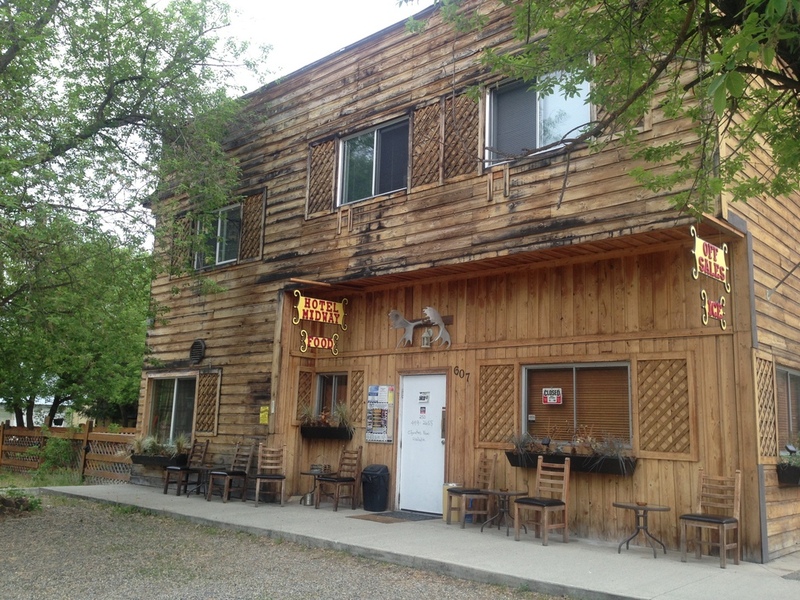 It was held at the most unique venue ever – the heART studio. If I had to describe in one word the feel of this gathering, it would be authenticity. The owner of the newly-opened studio Carrie and her partner Jesse, spoke about both being bipolar (which they said with a laugh makes them quad-polar). Carrie spoke how the best thing that happened to her was getting diagnosed, so she could begin getting treatment and understand why she felt the way she had. 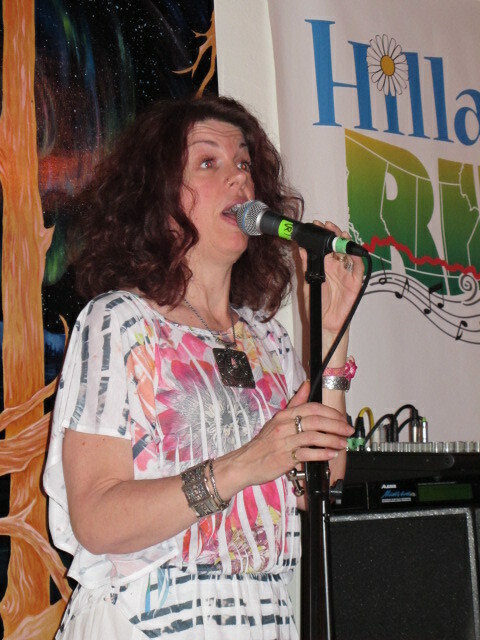 Sherri Funk, one of the many talented musical artists that night, talked very candidly about her husband Mike, who deals with schizophrenia. She eloquently conveyed how the family accepts this challenge openly and without fear, recognizing that mental health issues need to be addressed, but that they do not define him or their family. Her courage and insight was inspiring. Candace Giesbrecht was the representative from the Canadian Mental Health Association (CMHA), our partner charity in Kelowna, and talked about their services, including expressive art classes that are available to those with chronic mental health issues, free of charge. One particular point she made that stuck with me is how they assist clients successfully navigate the health system and learn what resources are available to them, which is much needed when first reaching out to get help. They had raffles for a variety of artsy items, from jewelry and paintings to books and wine. Some of the glass pendants being raffled were made by participants of the CMHA art classes. They also had some paintings for sale, with the proceeds going to CMHA. I bought a stunning abstract acrylic called “…give me Butterflies” done by JoJo. Imagine my surprise when I realized it was done by Joanne, who I had been speaking with most of the night. She said it was the first piece she had ever sold, so I am extra-honoured to be her first official buyer, and it is a beautiful souvenir of our trip. Big thanks to everyone else who played a part in organizing, performing and volunteering at the concert, including Tami and Andrew Smith, Suzy Gemmel, Michael O’Neill and Zachari Smith. Sorry if I have missed anyone. It was wonderful meeting all the supporters from the community too. We shuttled home to Oliver very late that night, well after midnight, so we got a slightly later start the next morning, which was Day 5, Sunday. And guess what? 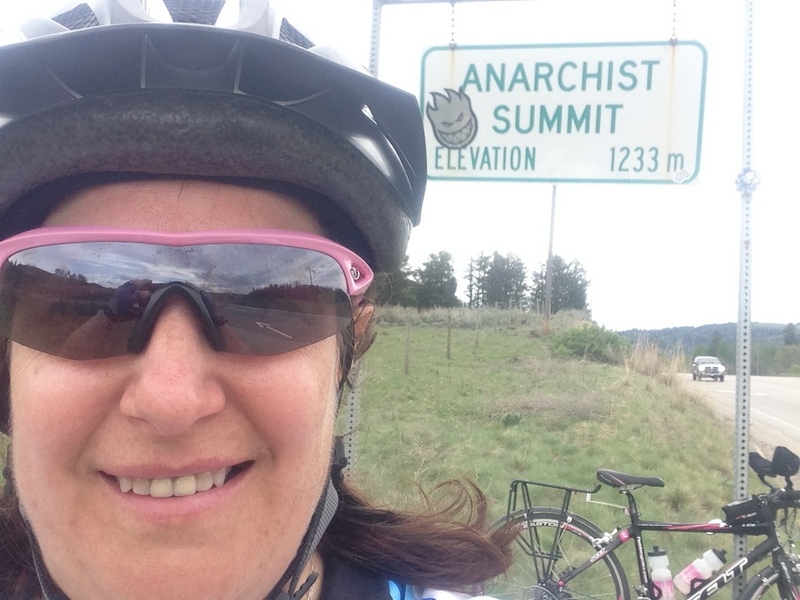 Another big climb from the get-go, up to the aptly named Anarchist Summit (I kid you not – see the photo below). 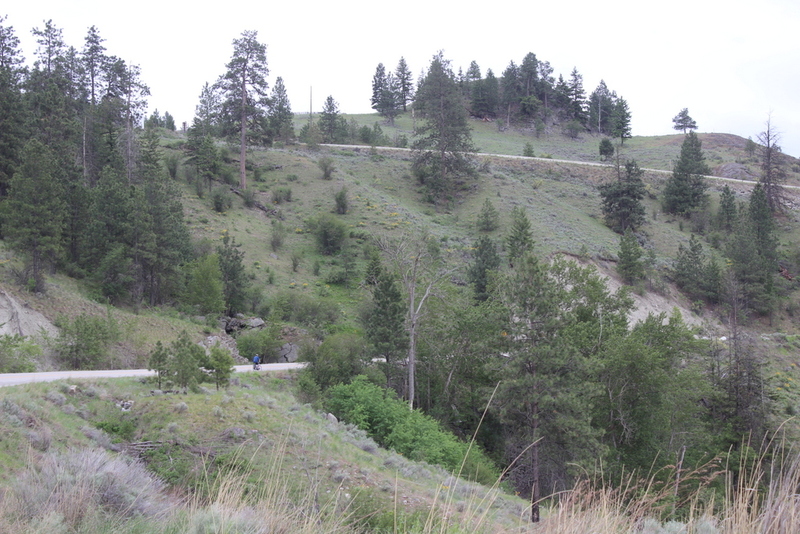 There were numerous switchbacks which make it a reasonable grade, but by no means easy. It is also a popular training spot for the local bike groups, as evidenced by the number of spandex-laden boys charging up the long hill. I barley noticed – really. It was definitely a grunt, but we have been getting well accustomed to spinning in our granny gears to save our knees and our energy. We were also very thankful that it was overcast, as we didn’t need another scorcher. Aren’t we fickle – first we grumbled that it was too cold to train with our late spring in Edmonton, and now we were bellyaching about it being too hot – humans, you just can’t please them! Getting to the top was quite the contrast. You move from desert, wineries and lakes, to ranchland, rolling hills and farm animals in a quick transition once you hit Boundary Country. It was so tranquil at the top – traffic quieted down, and I could have sworn one set of sprinklers I saw had been choreograghed by the Bellagio. 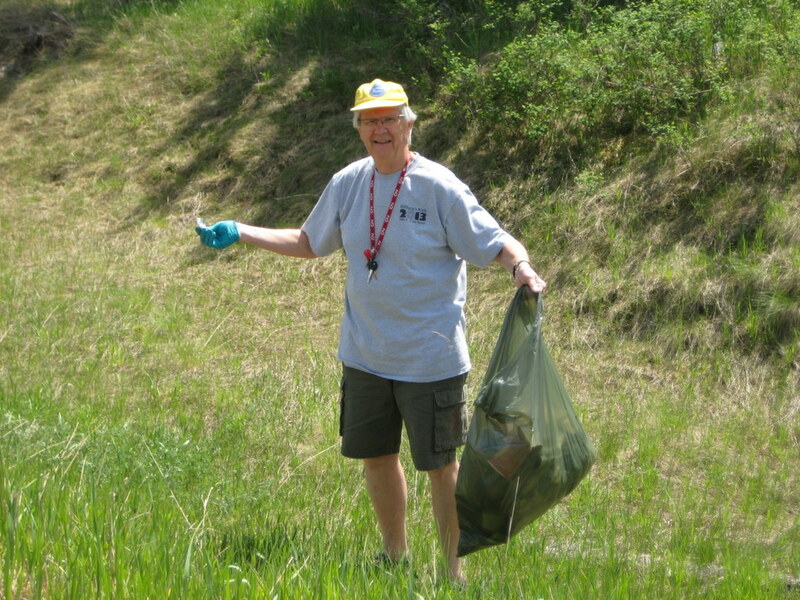 We gave a grateful wave to the highway crew that was sweeping the shoulders, removing the winter gravel for the upcoming tourist season – we were probably one of the first of that group to come. 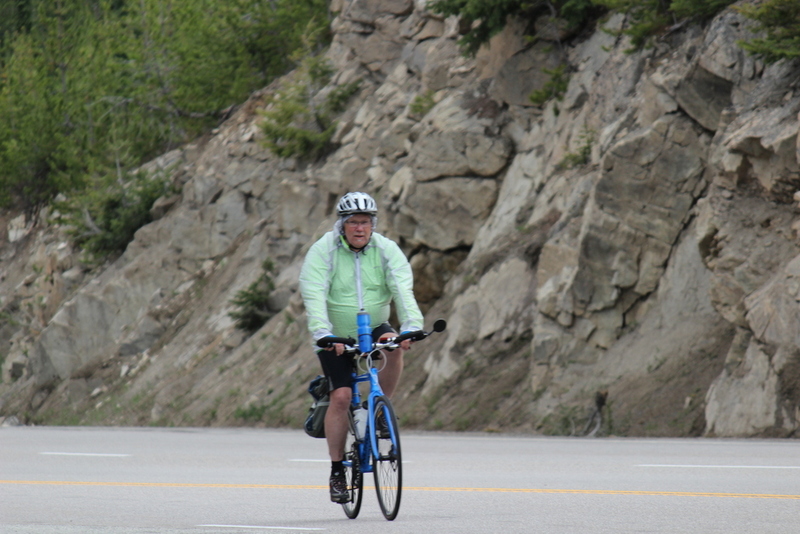 It was to be a bit of a shorter day to Midway with the monster climb out of Osoyoos, but I had my eye on the next day – 148 km with another long climb. Memories of our climb to Princeton came back to me with great clarity, and I decided that I would much rather continue on a bit today and save me some pain the next day. 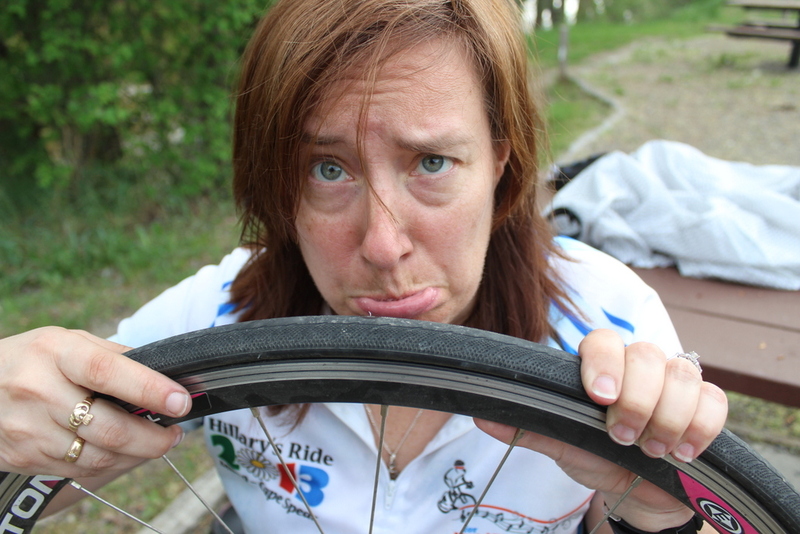 I managed to get about 18 kms down the road, but was thwarted by the first flat of the ride, courtesy of a piece of wire from a steel-belted radial tire, I believe. I was absorbed with my tire dilemma, and was caught off guard when I had a small herd of sheep run up to the adjacent fence and bleat at me – actually, I almost fell over, as I was so startled. My savior Patrick came to my rescue in his red Caravan so we could get back for our BBQ chicken and pasta dinner, whipped up by Terry with sous chef Patrick. After dinner, some of us went to the Hot-L pub (the “E” long ago burnt out on their Hotel sign, and the name stuck) to use the WiFi. We ended up talking to a couple of young tree planters working in the area. It never ceases to amaze me how everyone has been affected by mental health issues – either personally or through close associations with friends and family. Our friend spoke of his earlier battle with depression, loss of friends to suicide, and his challenges locating the appropriate support sometimes. I am happy to report he got through this difficult time in his life, and is currently doing very well. We also got some unexpected compliments. Al, our trusty driver, was picking up litter at a rest stop near Princeton while he waited for us to slog our way up a pass. Isn’t Al just a sweetheart? !- we think so!! 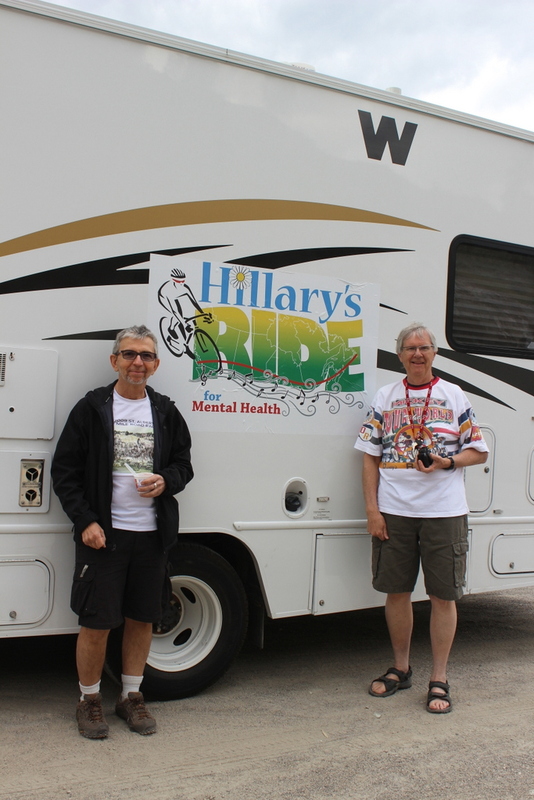 A vacationing couple home-bound to Midway spotted him and Bill on garbage patrol, and thanked them profusely as they said they had never seen someone do that before, especially visitors to the area. It was a bit colder at this higher elevation, and we had to use the furnace in the RV for the first time this night. Monday Day 6 out of Midway started with breakfast goodies at a great bakery in Greenwood, a cool little mining town just down the road. Patrick got me a massive cinnamon bun that lasted me two days, which he would periodically hang out of the van window as he passed me on uphills, to entice me to keep pedaling. They filled up our water jugs with the “best tasting water in the world”, which is actually an official title they earned through some competition. And I must concur, although when I’m cycling I could be drinking slough water and not notice a huge difference, as long as it’s cold! 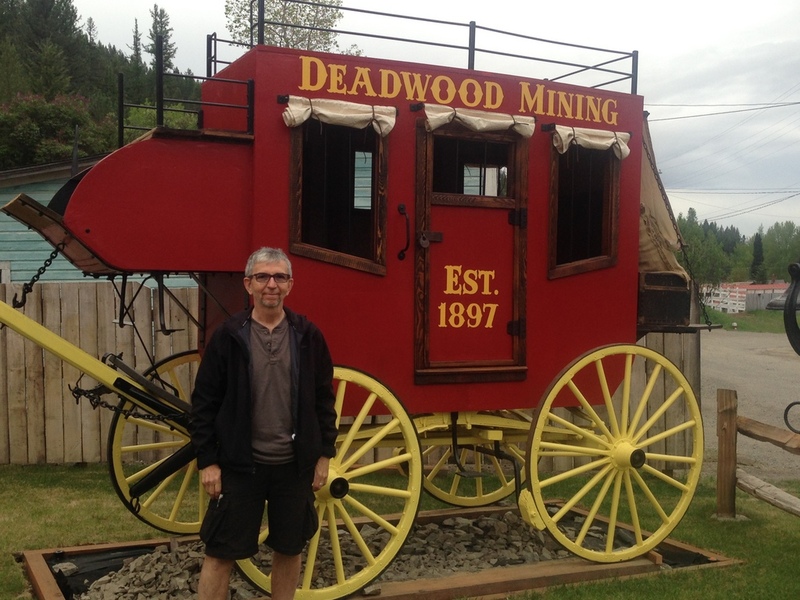 We were rewarded with a smokin’ downhill into Castlegar. The only bummer was that the wind had picked up a bit, and we had to battle it a bit to keep up our speed. This provided Bill and I with a great opportunity to practice some drafting techniques. And yes, Bill can draft behind me, but I know I get the sweeter part of that deal. And what a treat we experienced that night. 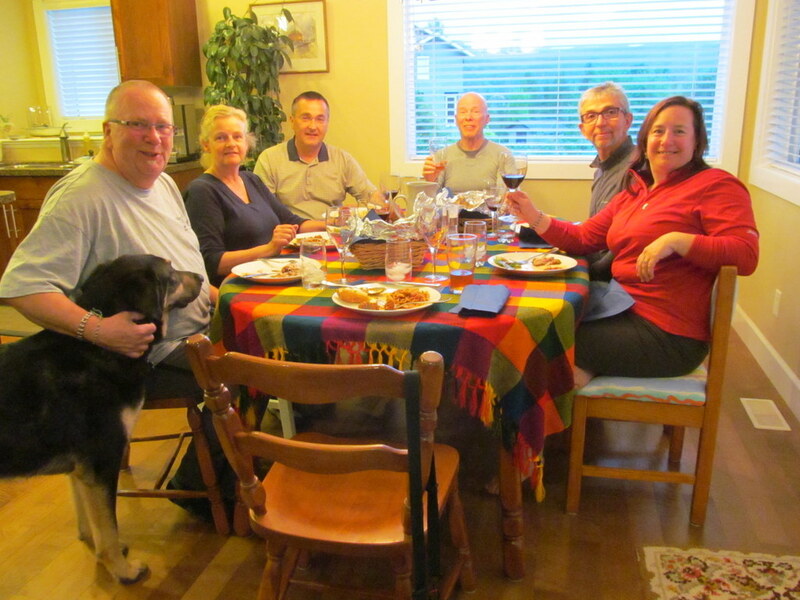 We received a gracious dinner invitation from Neil and Cathy Muth from Castlegar, through a series of coincidences. They had been in Victoria visiting their daughter, and had heard about the Need2 kick off concert through the local paper, so they attended. 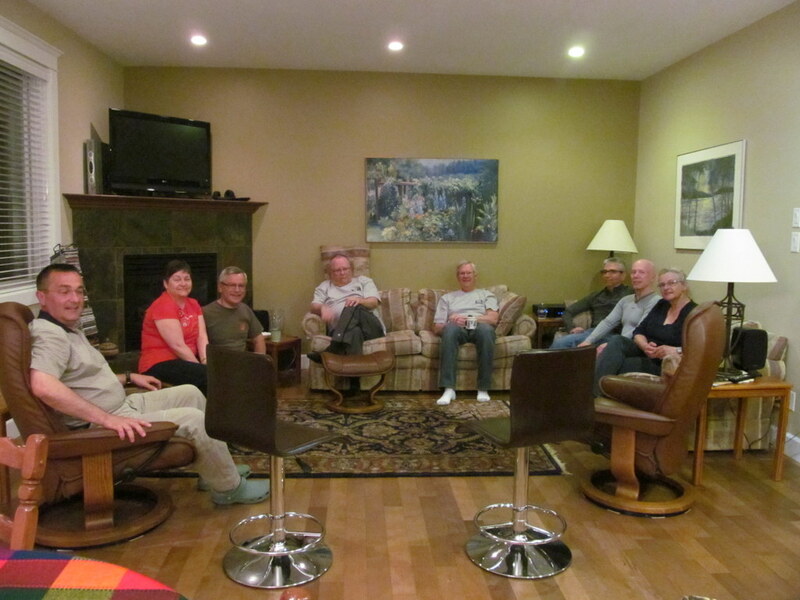 They followed us on the website and met up with us in Midway, spoke with Bill about our itinerary, and invited us to dine at their home when we got to Castlegar. How generous are they, and how lucky are we! I know we haven’t been away from home long, but it was lovely to get a home cooked meal, especially one we didn’t have to make. And it came complete with a homemade crisp and ice cream. Sure you don’t want to join us on the whole trip Cathy?? The Muths were wonderful hosts. Their neighbors Tim and Roberta joined us for dessert, and we had a warm discussion with topics including the trip and mental health issues , and also music and house concerts. 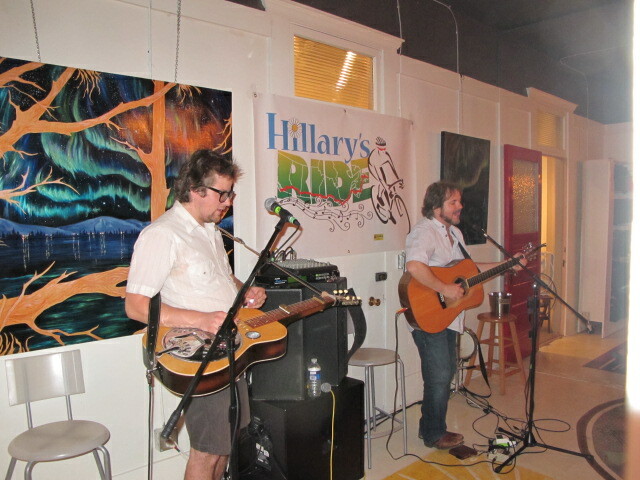 Bill commented that the music selection playing that night could have been from his own CD collection, and he discovered they had some musician friends in common too. To quote Disney, it is indeed “a small world after all”. We went home with full tummies and happy tastebuds! Wonderful update, Sue. Thanks for keeping us connected with all of you! Love your posts. Heartwarming! Thank you for taking the time to share with us. I love the way you write…keeps us right there along with you all 🙂 Thanks for that, Sue! …ps…I laughed at the part about the cinnamon bun (hanging it out the window…lol) that would work for me, too 🙂 Yum! Fabulous Sue – I feel like I’m riding along with you…well not quite as I’m not feeling your physical pain! I know every one of those switchbacks on Anarchist Mountain because that is where our retirement property is. If you are back in the area in fall 2014 you can drive up the mountain & we’ll welcome you with wine – bring the Boys!! Stay safe!! You are all an inspiration to many. So proud of all of you! Keep up the great work!